I wish I could say I never had cause to apologize to my children. It would be lovely if I never lost my temper or overreacted or failed to do the right thing. It would be marvelous if I never yelled or brushed off or rolled my eyes. I would be delighted if I never demanded too much of them or offered too little of myself. But I am human and I do these things. I snap impatient. I holler shame. I refuse selfishly. And in doing so, I wound those who are both the most precious and most defenseless: my children. I can know all the right things to do and say, focusing on relationship and connection as I gently guide my children through life...but I'm going to mess up. And when I do the wrong thing, I need to fix it. I need to make amends and restore the relationship I have damaged. And in doing so, I find such sweetness in a child's ready forgiveness. I remember being pregnant and tired and grumpy. I wasn't giving my best to my oldest. Gone were the days of peacefully and patiently wandering through our days together. Instead I was being snippy and loud, intolerant of his typical-two behaviour. Suddenly I was having to humble myself, kneel down, and apologize to my child. Part of me wanted to protest: But I'm the grown-up! He should have just listened to me the first time! What pride and foolishness it would have been to allow that to still my tongue and leave my child heartsick and ashamed. "I am sorry, Love. I shouldn't have yelled at you like that. It was wrong of me. God doesn't want me to treat you that way. He doesn't want anyone to treat you that way. He created you and you are His child, and He wants me to take care of you properly. Will you forgive me?" His forgiveness was always offered readily, putting to shame my own habit of holding on to hurt and anger. After granting me his forgiveness, he would hold my hand as I prayed aloud for God to forgive me as well. I wish I could say everything was sunny and serene again once the baby was born, but those days are long past. I am an imperfect person and an imperfect mother; is there any other kind? I continually strive for better, seeking those practices which help each of us to grow and bloom and thrive, but I make mistakes along the journey. I lose my temper, kneel, and apologize. I overlook the needful, draw near, and ask forgiveness. And by doing so, I discover relationships restored, hearts softened, self-worth reaffirmed, and connection strengthened. There is healing in apology, both for them and for me. There is beauty in a return to peace and connection. There is joy in knowing that we are not defined by our mistakes. Aside from prayer as I seek the Spirit's leading along this journey, there is no aspect of my parenting more important than admitting my wrongdoings and seeking my child's forgiveness. None of the rest matters if I withhold that which they need most: the knowledge and assurance that they are worthy, that they don't deserve to be treated poorly, and that my mistakes are not excused simply because I'm an adult. They need my humble and sincere apologies as much as they need my unconditional love. An apology from the one who has wronged them is sweet comfort and reassurance, and words of truth and worth and value nourish our children's souls. 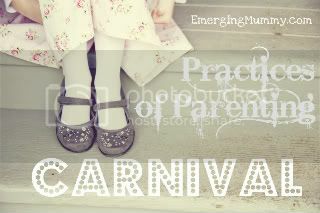 Today I am joining in Sarah's Practices of Parenting Carnival by sharing one of my own Practices of Mothering. For a wealth of wisdom and beauty, read the rest of Sarah's Practices of Mothering series. That's beautiful, and such a great reminder to all of us imperfect moms who find ourselves in the same situations from time to time. Thank you for sharing! You're right, our kids do need our apologies as much as our love. My babe just turned 8 months old today, and I've already had to apologize to her for losing my temper. Some people laugh at me, but I want to make sure I always apologize when I need to. I know she's little bitty, but I still think that on some level, she understands. I also hope she understands when I apologize every day for her parents...this poor kid has no chance at being "normal". Oh yes! Age is no exception for receiving a deserved apology here either. I was at a superbowl "party" with family last night when my 4 year old just couldn't keep it together, for one reason or another. Maybe she was tired, or not feeling well, or just cranky. Either way, frustrated with her tears and inability to mind that neither she, or I could make any sense of I gave her a tongue lashing that I am so sorry and ashamed of today. I said things that I regret and that weren't so nice and I can't wait to get home from work today and hug my baby and tell her I'm sorry. I was wrong, and I am so glad I read your blog. Inspiring, for sure. I'm so glad. Grace to you! I made a whole list of practices, and this was a big one. It's also important for them to see humility in action--such a good lesson all the way around! You write with such gentleness. "There is joy in knowing that we are not defined by our mistakes." Thanks for the reminder. I am sorry that was your experience, Ramona. I was fortunate to have a father who lost his temper quickly but was just as quick to apologize and ask our forgiveness; it was such a blessing and an encouragement. My mother, unfortunately, never did heal from her past hurts and come to a place where she could acknowledge her wrongs and apologize for them. The resulting scars still run deep and forgiveness towards her is a continual process. Beautifully written! I apologize to Kieran often, b/c when I speak to him in a way that I would not want to be spoken to, I want him to know that it's not my right to do so simply b/c I am an adult. I want him to know that he is worthy of my love, kindness, and respect! Ah, there's the word that's central to this all: respect. Thank you for sharing that. This is a great practice to remember. Thank you for sharing. I especially like the idea of children realizing that we parents (nor anyone else) should treat them in such a way. And I do love the way kids are so quick to forgive. This: yes. And what I've found, which amazes me, is that in practicing honest apologies with my family, to whom I feel the most tender, it's become easier to practice authentic apologies in extra-family relationships, too. So the very practice of apologizing becomes easier, and less scary. C, I *seriously* have almost this exact post in my draft folder right now. You totally read my mail on this one. Love it, love it! Too funny! I'm so glad you enjoyed it. Thank you, Sarah, for putting this Carnival together. It has been so encouraging to read through each of the (many!!) submissions. wow, love this... apologies need to happen. on bad days where i feel like my mother (and not in a good way), the enemy can make me feel very guilty with flashes of the encounters with her i hate to remember. but then i remember that i say i'm sorry to my children, and that makes all the difference in how the story ends. Oh, how I can relate to that entire thought process. It really does make all the difference though, doesn't it? Thank you for this. I, too, make a conscious effort to apologize to my children when I need to. They are very forgiving (lucky for me). I agree. We all deserve to be treated with respect and kindness. Apologies need to flow both directions. Well written post. This is a huge one for me. I cannot recall either of my parents ever apologizing to me until my dad did once when I was 16. I remembering bawling and bawling and then such healing! With his one apology so much anger and hatred I had allowed to build up was gone. I am constantly humbled by my daughters willingness to forgive and I have noticed a freely apologizing spirit in her as well. Kids truly do learn by watching our every move. It can be so hard to admit I messed up but the restoration of relationship is so priceless. LOVE! I never saw this modeled as a child, and I am determined to model apologies and forgiveness to my kiddos. Well written! I love this! It is so hard for me to apologize.....which is the exact reason that I NEED to practice this with my girls. When I apologize, I admit some failure on my part. They need to see me mess up....so that they will know that it's okay to get it wrong, and how to make it right. Thanks for sharing! So good-- I have received so much grace for my boys, and hopefully the model of humility in seeking their forgiveness will stay with them-- thanks for writing about this! so central! I love this practice post. Last baby shower I was at, the question was posed for all mothers to give your big piece of motherly advice to the first time mother guest of honor. this was all I could think of. Apologize to your kids when you are wrong. that was the only think I could think of that could qualify as wisdom to be applied universally. No family should go without this practice! A friend of mine once said that the best thing her mom ever did for her was teach her what to do with her sin by practicing apology, repentance, forgiveness, and grace liberally in her home. Her words have always stuck with me as a mother, and I apologize to my children all the time as a result. Thanks for the reminder and the solidarity. As I read your post I cried. I feel so ashamed at being so hard on my daughters especially my eldest who is having a tough time at the moment. So much so that as I lost sleep over feeling so bad about the way I have approached the situation. I prayed for help to be wiser and to find a way to make the situation better and amazingly I found this post. I can't wait till morning where I can hold her and sincerely ask for her forgiveness. Thank you for putting your beautiful words out there for the likes of me to find. We're going on a treasure hunt!